The Saints players who took to the field at Sandy Park will probably have had heard the sound of referee Greg Garner’s whistle in their sleep last night. That shrill sound will have haunted them on their way back from the west country as, time and time again, they fell foul of the man in the middle. That is not to say all of the decisions were all wrong. Just that Saints really struggled for discipline during a second half that undid one of their best 40-minute showings of the season. Jim Mallinder’s men had been in total control at the break, scoring through Lee Dickson and Ken Pisi. They were razor-sharp in attack and resolute in defence, keeping the Chiefs at arm’s length. The hosts, who had only lost one league game at home all season, were constantly stopped in their tracks by a wall of grey. Saints’ smothering pressure forced errors, turnovers and laid the foundations for attacking bursts. Having won five of their past six games playing some fine attacking rugby, they continued in the same vein. The swagger was still there and both tries involved fine work from several members of the side. But that swagger evaporated after Garner’s whistle blew for the break. From then on, it was one-way traffic. Exeter were the ones doing the suffocating and they just would not allow Saints to get out of their own half. In fact, had a few fans set up deckchairs in the home 22, they would have had a serene second half, untroubled until the final couple of minutes. Because Exeter, who scored 17 unanswered points after the interval, refused to relent. And Mike Haywood’s 49th-minute sin-binning was an open door that they waltzed through via Olly Woodburn’s try. Saints, who had looked so secure, were suddenly on the rack, and there was no way back. Garner continually awarded the Chiefs penalties, with the home side winning 10 to Saints’ zero after the interval. No side can expect to win with that kind of count stacked against them, and so it proved. Saints had been serial offenders against Sale a week earlier, but turned it around in the second half, with a squeaky-clean final 40 minutes earning the win. This time, the tables had turned. And how much it hurt them after all they had done before heading in for half-time. A win would have kept them in the top four, but, as it was, Leicester, who beat Saracens, moved back above Mallinder’s men. Saiints will probably have to get points on the road if they are to make the play-offs for a seventh successive season, and this game should have brought some. But they just couldn’t get any control after the interval with their kicking out of hand, which had been immaculate during the first period, failing to relieve the pressure. The wind was a factor, but it shouldn’t have been worth 17 points to Exeter. 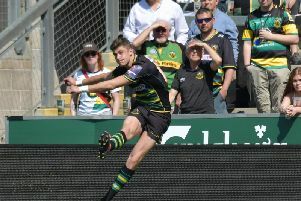 Garner’s decision to disallow George Pisi’s late score deprived Saints of a losing bonus point and it has to be said that it was a harsh call. The official did side with the home team after the break, but Saints will know they should never have allowed him to. They have responded well to setbacks this season, and they will have to do so again against Harlequins on Sunday. But if they are to do that, they will have to ensure that the overriding sound of the game is not a whistle highlighting their errors.